It's time for the annual 93.3 Big Gig, coming to Fiddlers Green Amphitheatre on Sunday 15th July 2018! 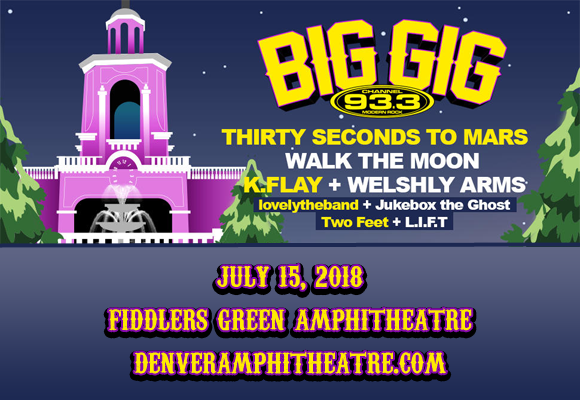 This year promises to be more exciting than ever as Jared Leto-led rock juggernaut Thirty Seconds to Mars lead the line-up for this epic event, plus there'll be sets from perky pop-rockers Walk The Moon and alt-hip hop sensation K. Flay! Formed in Los Angeles, California in 1998, 30 Seconds to Mars is an American rock band, comprised of Jared Leto (lead vocals, guitar, bass, keyboards), Shannon Leto (drums, percussion) and Tomo Miličević (lead guitar, bass, violin, keyboards, other instruments). The band's second album, A Beautiful Lie (2005), served as their breakthrough, bringing the group mainstream success. Since then, the band's success has only increased, with their 2012 album Love, Lust, Faith + Dreams hitting the Top 5 in the UK, Germany, Italy, Austria, Portugal, Australia, Mexico, Switzerland and Poland, and number six in the US and Canada. The band's Into the Wild Tour (in support of their 2009 album This Is War) achieved the Guinness World Record for the longest ever tour by a rock band – 30 Seconds to Mars played nearly 60 countries on six continents, selling out arenas and performing over 311 shows to three million people.